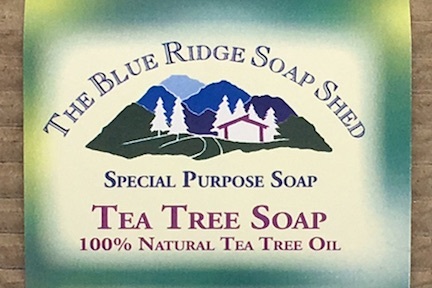 The Soap Shed specializes in creating unique, special purpose soaps of all kinds using folklore associated with herbs and essential oils. We make soap to soothe dry Diabetic Feet with Ginger to stimulate circulation and Tea Tree as a natural antibacterial. We make some soaps to remove fish odor (Kitchen Cook Soap) and others to remove human odor (Anise Vanishing Soap for Hunters and Fisherman. Still other soaps are formulated to aromatically relieve the stress of Hot Flashes (our Hot Flash Soap with Lavender to calm and Spearmint to cool), Many other soaps are created to address specific puzzling skin conditions like Rosacea (ROSIE, a shea butter facial soap), acne (Lemon-Tree) and eczema or psoriasis (Shea Butter Soaps). We even make a 100% natural soap for dogs! None of our soaps are intended to cure or treat disease, simply to be the best cleansing support we can make, for whatever skin challenges you're facing. This 100% natural licorice-scented soap helps disguise human scent from fish and wildlife. Our three most popular outdoor soaps for daytime use by hikers, bikers and daytrip travelers. An all-natural topical salve for frustrating skin rashes, herpes, ringworm and fungal infections. Natural essential oils that deter insects, in a liquid roll-on glass container. Our Bug-Me-No-More Bar is loaded with five natural Essential Oils known to discourage winged creatures. Castile Soap for Chemotherapy and Radiation patients is a 100% Olive Oil Soap made with no fragrance whatsoever. Castile Soap is most frequently by selected those undergoing chemotherapy or radiation because it soothes the burning irritation many experience while undergoing treatment. Our Charcoal Soap clarifies and detoxifies your skin without dehydrating it. A 100% natural Handmade dog soap for bathing your dog, with NO artificial or synthetic ingredients to cause allergic reactions. Ginger and Tea Tree Essential Oils with natural antibacterial qualities to reduce infection from cuts and cracks. Made with stoneground cornmeal grits, coffee grounds and pumice to tackle the extreme challenge of removing the toughest grease and grime from mechanics' hands. Hot Flash Soap. Lavender to calm you and Spearmint to cool you, this luxurious goat milk soap is made for rejuvenating baths and quiet times. Intertrigo is a fancy name for a rash that develops between the folds of skin under the breasts, stomach or armpits. Anytime your skin gets warm and sweaty, conditions are perfect for intertrigo to develop. Our Jewelweed Salve for Poison Ivy, Poison Oak or Poison Sumac, made from fresh Jewelweed herb harvested here in the mountains each Summer. The Jock itch fungus only affects the top layer of skin, making it very possible to treat it using just a good, natural soap – like we just happen to have! A kitchen soap with a purpose and place - to remove kitchen oils and odors from your favorite cook's Hands - maybe that's you? Our Kitchen Soap moisturizes too.